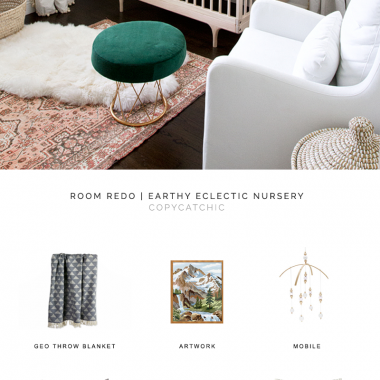 I am loving this sweet nursery design by Sarah Sherman Samuel. Doesn’t it give off such a wonderfully cozy and comfortable vibe? 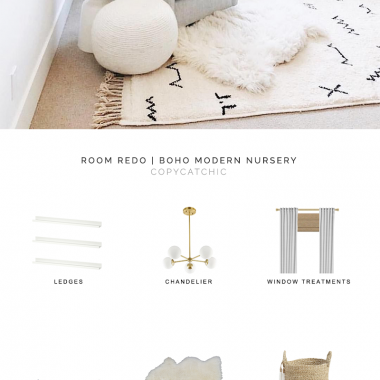 I adore the mix of textures and colors, all coming together to create an oasis for a brand new little one. 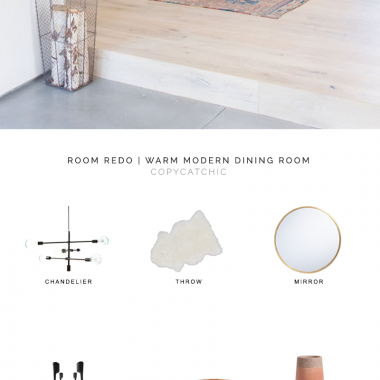 She has really achieved a balance between calm earthy tones coming from the decor and furniture, combined with the bright pop of color within the vintage rug and modern ottoman. I really admire nursery designs that can clearly grow alongside baby and, with minor swaps, can be adjusted to an amazing big kid’s room! 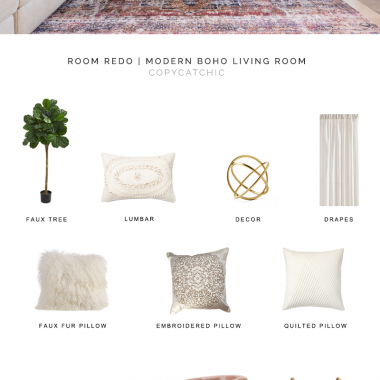 This gorgeous living room design by Camille Styles absolutely nails the modern bohemian style! Natural touches such as woven baskets and pops of greenery mixed with contemporary pieces such as the low-back neutral sofa and pedestal coffee table create such a perfect balance between modern and eclectic styles. I am just loving the distribution of color and textures throughout the space — I can absolutely see myself cozying up on that sofa and gazing out those phenomenal doors! 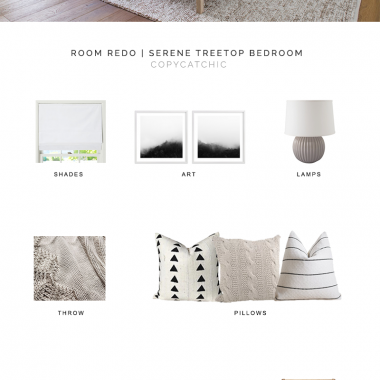 Emily Henderson does it again with her Portland project’s master bedroom! This space is packed with luxe details, and you’ve got to click through to see the whole other sitting room side of it. 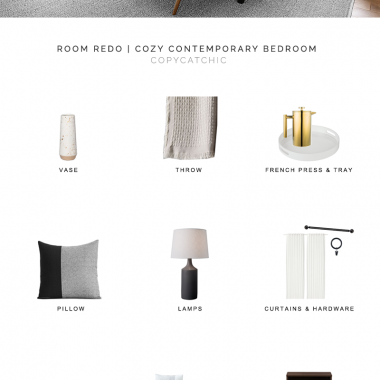 Today we’re recreating the bed area, featuring sleek contemporary and mid-century pieces for a clean, unfussy look. The palette is a serene, neutral one with just a hint of indigo blue, and the canopy bed is such a showstopper (that we scored for way less!). Hope you enjoy this simply stunning space as much as we did. 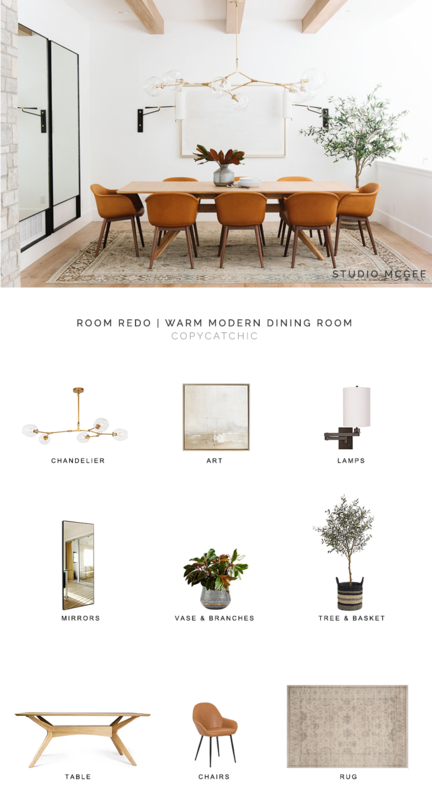 Maybe it’s the winter blues that have us gravitating towards warm spaces, but this dining room by Electric Bowery is the perfect remedy. The trestle table, which could lean farmhouse in a different setting, looks amazing juxtaposed with modern windsor chairs in sleek black and a contemporary light fixture. The sideboard is as stylish as it is functional, and eclectic accessories on top are the icing on the cake. Today we’ve recreated the nursery heard ’round the (Instagram) world! 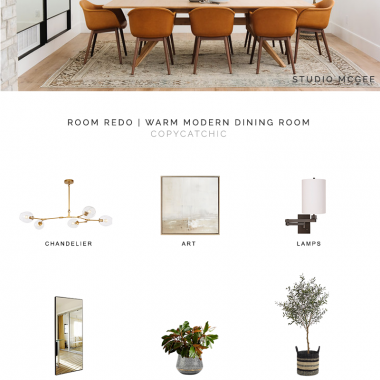 Designed by Melanie Price, this darling space captured our hearts immediately with its perfect boho/modern mix. I love how this room doesn’t scream “baby!” It’s neutral and serene, and I’m guessing it will age just as well as its lucky occupant. Lots to love! 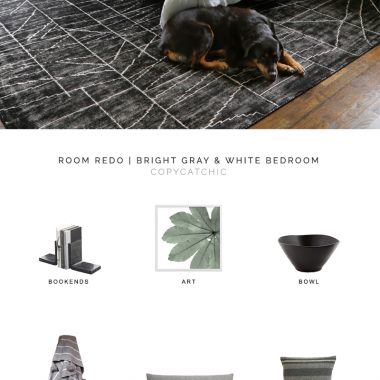 A warning about this Room Redo — the cute pup is not included! But we have scored some amazing savings for you to make up for it. Designed by April Tomlin, this space is simultaneously airy and grounded. The white walls, breezy curtains, and towering bookcase and canopy bed allow your eye to float upwards, while the chunky nightstands, deep charcoal rug, and woolly textiles give the room depth. I love the black and white family photos in cohesive frames — such a sophisticated way to display sentimental treasures. What’s your favorite part of this chic bedroom?